A dark, atmospheric look at a terrible real-life event. Released November 14. Stars: Steve Carell, Channing Tatum, Mark Ruffalo, Vanessa Redgrave. Director: Bennett Miller. Distributed by Sony Pictures Classics. The distribution company provided an advance screening of this film. 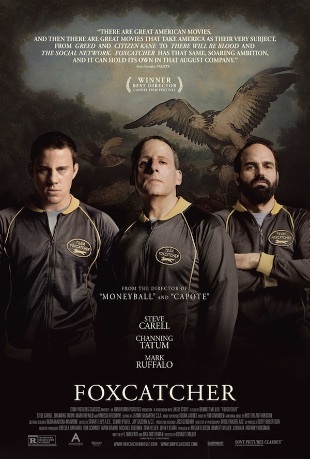 A strange thing about Foxcatcher is that I didn't realize it was a true story until I actually sat down to watch it, which is strange because it's a true story that happened in my lifetime which I imagine would've had to be pretty high-profile. And yet, no recollection of it ever crossing my radar. It's hard to remember a time when every piece of big-ish news was immediately ubiquitous, but there you go. Anyway, in case you don't remember this either: In the 1980s, John Du Pont -- heir to the Du Pont family fortune -- decided to turn part of his sprawling estate into a training facility for amateur Olympic-hopeful wrestlers, using his money and influence to turn his "Team Foxcatcher" into the official hub of American wrestling. In 1996 he shot one of Foxcatcher's head wrestlers to death in his driveway, and was later discovered to have been suffering from paranoid schizophrenia for some time but had been shielded by his fortune. Foxcatcher makes an effort to understand what, exactly, went wrong with Du Pont and his ill-fated drive to become a coach and effective "owner" of American wrestling. 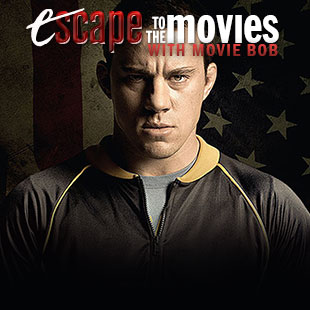 Steve Carrell has the showy part as Du Pont himself, while Channing Tatum is a former Olympic gold-medalist wrestler with whom he becomes obsessed and Mark Ruffalo is Tatum's fellow Olympian brother who tries to intervene only to get sucked into Du Pont's creepy web himself. There've been a few attempts to work out the hows and whys of the "Foxcatcher Farms Murder," but the film, from director Bennett Miller, is more interested in working out Du Pont's psychosis and the unnerving ways it manifested. But on the way there, it can't help but dredge up the complex cocktail of privilege, power, politics, Americana iconography, psycho-sexuality and male self-identity that appears to have informed his unique yet oddly banal madness: It's essentially TOXIC MASCULINITY: THE MOVIE. ...but doesn't actually grasp any of it -- not a captain of industry or capitalist lion-tamer, but the degenerate descendant of once-great men who, pathetically, thinks nothing of asking his "friends" to call start calling him "The Golden Eagle." Drained of humanity by the rot of his own privilege and (the film heavily implies) a latent self-hating homosexuality that he can only, well, "grapple with" through his fixation on wrestling and Tatum's easily-manipulated, emotionally-vulnerable beefcake. Given this kind of setup, it's surprising that the film isn't actually more lurid than it is. The diseased psychology underpinning Du Pont and its effect on everyone around him is played in terms of quiet menace and foreboding, apocalyptic atmosphere. Even without foreknowledge of the true story, a sense that something awful is approaching and that someone should really "do something" about it pervades every frame, creeping in around the edges of a film that mainly just wants to be about men and how they relate to one another in the context of intensely masculine spaces like athletics and Du Pont's old-guard corridors of power. It's obvious why Carrell has leaped to the forefront of potential Best Actor nominees, and also why Tatum has racked up another round of notices for just how versatile he's turned out to be. But attention also has to be paid to Mark Ruffalo, who renders himself almost unrecognizable as a gentle bruiser whose imposing demeanor hides a good man trying to subsist in a bad man's world. This is the time of year when a lot of quote-unquote "Oscar bait" is angling for attention, but Foxcatcher is a really good example of a nice, subtle actor's showcase. Worth checking out. Bottom Line: A really good example of a nice, subtle actor's showcase. Recommendation: A must-see for fans of the main cast, and a good watch for anyone seeking a low-key drama with a dark edge.